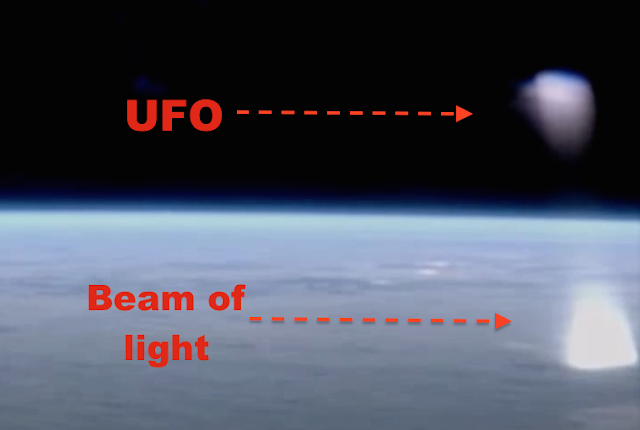 UFO SIGHTINGS DAILY: UFO Near Space Station Makes Beam Of Light Scanning Earth! Jan 2016, Video, UFO Sighting News. UFO Near Space Station Makes Beam Of Light Scanning Earth! Jan 2016, Video, UFO Sighting News. This UFO was caught by Streetcap1 of Youtube and shows a UFO with a beam of light hitting Earth. The UFO is scanning the planet for some reason, probably trying to calculate the number of life forms/types in the ocean. Human pollution and how fast we destroy our own planet does concern them...since it was theirs long before it was ours. These appeared at the right hand side of the screen briefly then moved out of frame again. I took a still photo of them and sharpened the picture which appears at the beginning and end of this short video. Streetcap1.